Bio: Susan Lampinen was born in Sudbury, Ontario, Canada. She read environmental science while she continued to express herself through painting and drawing. In 1990, after working in the environmental field for several years, her part-time interest in art became a full-time profession. She opened Lampinen Fine Art and Custom Framing, her own gallery and studio in Sudbury in 1995. Since then, Sue has won the distinction of being selected as one of the Master Pastel Painters of the World showcased in International Artist magazine and she has had a feature article in November/December 2007 issue of The Pastel Journal. She has also had artwork chosen to be part of the Ducks Unlimited Canada National Art Portfolio, and the prestigious Birds in Art Exhibition. 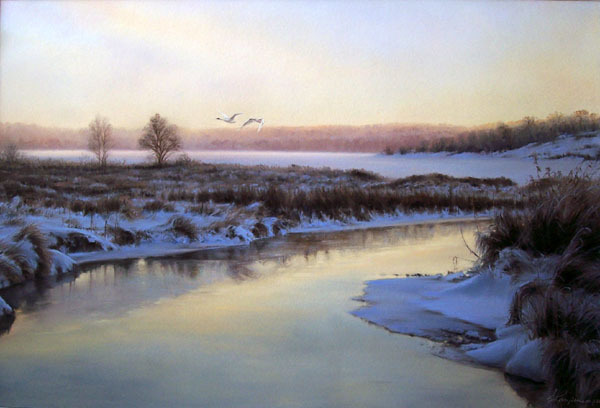 Sue is an elected member of both the Pastel Society of Canada and the Canadian Society of Painters in Watercolour and one of her watercolour paintings is part of the Watercolour Society's Diploma Collection in Brampton, Ontario. Sue has studied with Dwayne Harty, Zoltan Szabo, Brian Atyeo and Jack Reid. Medium: Pastel, graphite and watercolour. Navigation: Websites don’t come any simpler than this - one single page. Gallery: Thumbnails on the homepage. Image View: Click thumbnails to view. I suggest right click, open in new tab/window. Otherwise you navigate away from the main page and must use the PC backbutton to return. Thumbnails enlarge to give information on medium, support and size. They may be saved. Morning Light is 16x24 ins, 600x408, 62 KB.